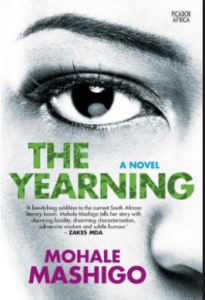 The Yearning is the story of Marubini, a young woman whose past starts spilling into her present. She resides in Cape Town and seems to be living a comfortable life, working at a wine farm and spending idyllic days with her friends. It isn’t until she suffers a ‘seizure’ after she is haunted by a song and figure from her past, that things start to change. Doctors cannot find the cause of her seizures. Marubini begins to suspect that what is happening to her may have something to do with her grandfather’s death and her father’s brutal murder. Something from her past is making her sick and her mother is not willing to tell her what it is. Marubini embarks on a journey that is both magical and frightening to find out what it is that haunts her.